Daphne hosts Harvest Monday on her blog. Go check out the wonderful things people are harvesting. Some Principe Borghese drying tomatoes (already split and in the oven), some red bells, destined to be roasted red pepper soup, and a handful of strawberries. I actually picked about 1 1/2 cups of berries, despite them being not watered enough. Those Tristars are rock stars! Every year I say I need to grow more bell peppers. No matter how many I plant, it's always true. I've done some whining on this blog about how difficult keeping things watered here is. Partly it's due to our terribly sandy soil, partly due to the soaker hoses being tempermental, partly I need to get out there and amend things. I had noodled around with the idea of using an old technique, bandied about a lot by permaculture folks, of hugelkultur. Basically, you're making a sponge of wood and biomass under the growing layer. Since we have both overly permeable soil and a bit of old wood and brush lying about, I got some help from Eric and made an experimental bed. First, we dug out the soil about 18" and set it aside on a tarp. Then we layered logs and pieces of logs on the bottom. Over that went branches of the plants we'd cut down a few weeks ago, then a layer of fresh chicken manure and bedding, and then those layers were watered down. Over those went the totally uncured material from the compost bin. Turns out, if you never ever water it, and it dries out, you're not composting, you're preserving. Amazing things there were. This time, they got watered. Maybe those paper coffee cups will finally break down. Finally, the soil got shoveled back on top. I stopped every time a "layer" was completed, shoveling the soil on in flattish bands, and wetted each one as well as I could. It wasn't 100% effecive, as the soil shed some of the water, but it seemed a good idea. When it was a large, flat mound, kind of like a stubby mesa, the experimental planting began. I started seeds a while ago, and they have been doing well, but very much needed to be moved from their six-packs. Half of each six-pack went into the new bed, half into the barely prepared rest of the bed. During the work, I'd discovered a handful of self-seeded kale or broccoli or something, right where the handle of that hand fork is. That will provide yet another point of data. I'll have to keep hand-watering this bed until it rains, partially because it's not in shape for a new irrigation system, and partially because I apparently shoveled the soaker hose in half while removing it. It seems ages ago since I planted these, but the brussels sprouts are finally sprouting. I doubt that they'll be any good, but some day I'm going to figure out how to grow them in our climate! So that moved about 1/6 of the broccoli and kale I'd started. I suppose tomorrow I'll get out there and prep and transplant the others, plus the leeks and onions. I can't wait for the easy days of winter gardening to really begin here. 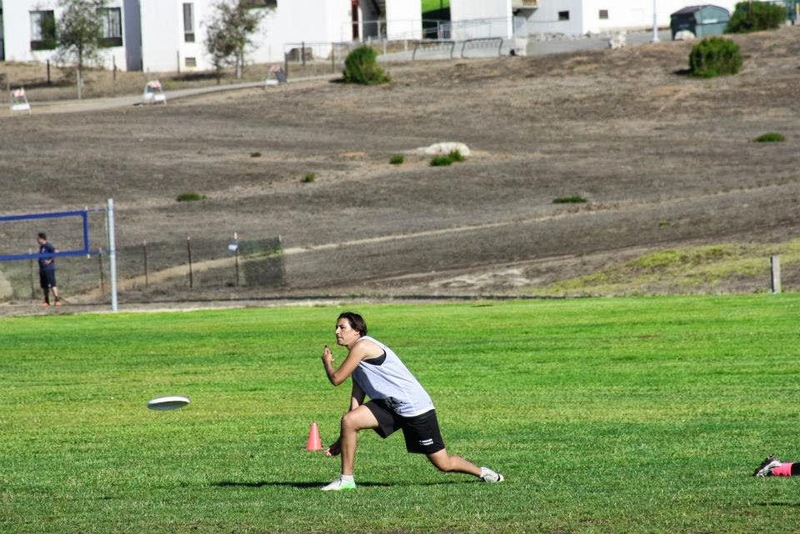 Feet come pounding down the field, shouts from teammates: "Go, go go!! Yess, you've got it!" My daughter jumps, catches, lands, turns, taps the disc on the grass in the end zone and leaps into her teammates' arms. For six years, I've sat on a sideline, in heat, rain, and wind, watching my children play other mother's children in Ultimate Frisbee. Those six years have coincided with tremendous growth for my daughter naturally, but the person into whom she has grown has been deeply shaped by this sport. 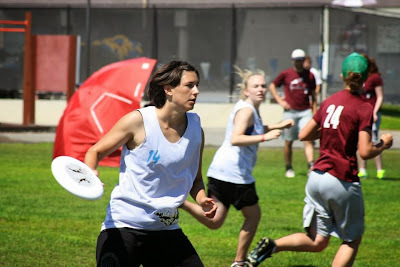 Whenever a parent of a daughter asks me what ultimate did for mine, I say three things: It gives them a voice, gives them a body, and gives them a tribe. 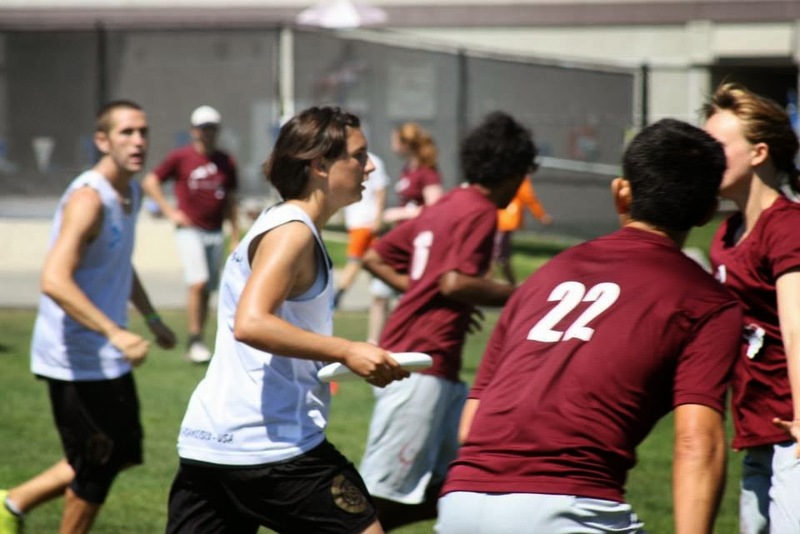 Since Ultimate Frisbee is self-refereed, the player herself has to make a call of foul or out of bounds or stall count. Her fellow players can't call it; her coach can't call it; and she might have to argue with the other player about her call. It might take her years to do that (it did mine). But when she raises her head and yells, "Stall!" it's all her. And here's the thing -- her take on the situation: a rule has been violated -- is assumed to be valid. She and the other player will stop the game, decide if they can agree on the call, and then their decision stands. It can't be overruled by outside agents. Even if they disagree, she gets to make that call and the game will resume either from that point or the one before it. 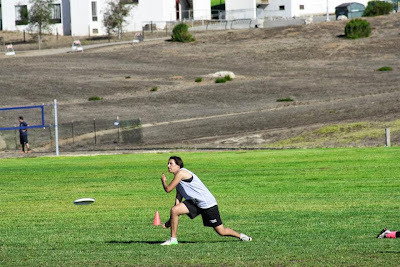 If a girl wants to play well, she'll spent a lot of time throwing a disc, running, diving, jumping, and generally working very very hard. She'll learn that if she places her fingers in just this kind of vee shape on the underside of the disc, it will curve this way, or that. If she balances on the balls of her feet, and swings an arm down, she's more likely to make that hand block. For a society that puts a lot of messages out for girls to focus on the outsides of their bodies, and what they look like, Ultimate is the antidote. It forces them to inhabit their bodies fully in order to play. When my eldest daughter watched the girls on the high school team take the field when she was a skinny little thing, she'd sigh, and say, "They look like tigers. I want to be like that." And they did. That arrogant, stalking walk, the way they'd line up for the pull -- these were girls who had more on their minds than how they looked. They were there to play. And those girls? They embraced the young woman my daughter was right as she was then -- no matter that she wasn't as tough as they were yet. The boys on the team formed the same kind of welcoming mob. Every tournament begins with an arm-linked circle. Every loss is met with supportive hugs; every win celebrated with joy. The Spirit of the Game, the idea that there is a higher ideal than winning, that fierce competition doesn't mean acting in unsportsmanlike ways, supports the players. My girls play with kids younger than themselves; they play with adults and against teams of college students. In each case, it's assumed that they are all the same kind of people -- Ultimate people. These kind of people are family of a kind forged by lots of work, lots of experience, and more fun than seems quite reasonable. 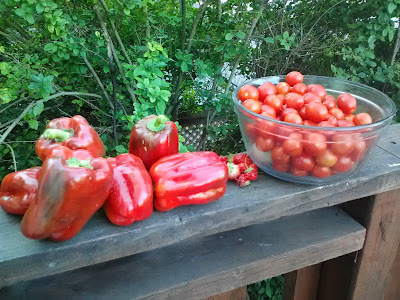 Imagine my surprise when the camera's memory card didn't only contain pictures of today's incredibly bountiful harvest. You see, Eric and I had taken the younger children away for a short backpacking trip near Tahoe, which was wonderful, but I'd left the camera home, partly because it is kind of heavy and partially because I'd misplaced it. Oh well, I took lots of mental pictures: the eight year old ahead of us on a trail overarched by huge trees; the two kids playing teetertotter on a log caught between two trees; the perfect bijou lake; the clear water; Eric's face next to mine in the tent, even though I was all wrapped up in a sleeping bag and he looked a bit hot. . . But today, after yesterday's post-trip bout of laundry, laundry, dishes, dishes, dishes, returning camping gear to the proper shelves, washing camp cook pots, was over, I headed out to say hi to the garden. I came back with a lot of stuff. I took pictures of it. Then came the work of changing it from fresh food to storable food. Roasting. Soup-making. Giving some away to the kid with the sprained ankle when daughter called and asked me to bring an ice pack to the field. His mom said thanks. . .
And the day went by in this way. Finally, the house quiet, the kids down for the night, the dogs even quiet, I remembered -- I wanted to post my harvest pictures. That's right. The cat one I took the day I left, but apparently the weekend was lots of Ultimate, as daughter #1's club team qualified for Regionals -- with a twelve year old on the field -- too bad Regionals is in Arizona, the weekend before her first college classes, and those of a teammate, and another teammate just sprained his ankle today. . . and apparently daughter #2 and I are going to have to talk about playing with fire in a wooden Victorian house because you know, when you're 13 and you do a LOT of declaring that you Are All Grown Up Now And Responsible, Thank You Very Much, then maybe taking pictures isn't the smartest thing in the world. Let us turn our gaze away from the travails of rearing the young and look at rearing veggies. Whee! Tons of Principe Borghese for drying, behind them the Early Girls from one vine. Ripe red and yellow peppers, to roast and blend into the tomato soup that half of the Early Girls made today. A couple of Romanesco zucchini, two Marketmore slicing cucumbers, and a bunch of Persian Baby cucumbers. Lots of everything summer, in my garden. Vegetables are easier, but they can't throw a Frisbee. Guess I'll keep both harvests then. Even the eggs vary. I think one hen must have hogged the kale scraps or gotten a beakful of bugs. If the hens free-ranged truly, their yolks would all look that orange. Of course, we wouldn't have any vegetables from the garden, but that's the way it goes! As far as I remember, they tasted exactly alike. Perhaps because they were beaten into pancakes! The dogs wake me up every single morning, generally earlier than I'd prefer to get up. Some days I get up, let them out, feed them, and collapse back in bed. Some days not. Today I realized I'd like not only to keep to a sleep schedule that works, but also that I had something to do. Generous friends are one of life's many many blessings. I try to spread my garden produce around, so sometimes willing friends are the key (I'm looking at you, cucumbers!). But today I processed the fruits of another friend's generosity. Jenny's mom has a pear tree. Now I have pears. I'd gathered up what I needed to preserve them some days ago, but they really weren't ripe, as so comically noted by Eddie Izzard. Pears show up around minute 5. . . In the quiet of the morning, however, armed with a pot of tea and the already-read newspaper by my side, I got going. Pot of syrup starting to simmer (I use a very light syrup; I don't want to candy the fruit. . .), jars sterilizing in the pressure canners, lids washed and in hot water, time to cut some pears! That cutting board was a gift from my woodworking father in law. I use his cutting boards all the time. And, you know, they weren't perfectly ripe. Maybe two more days might have done it? Or maybe they'd all be mushy like that one sneaky one. I figured that since they were going to simmer, I could err on the side of firm. My measuring spoons were easily repurposed into cutting tools. And I also had a bowl of water and lime juice. Ideally, they wouldn't get any brown spots, since they aren't exposed to air for very long. Peel, soak, simmer, jar. . .
Who, who, who's tired of pears already? Simmering in the syrup, along with a couple of vanilla beans for flavor. I tried some whole, because I thought they'd look pretty in the jar (and maybe in the future on a plate). From syrup, into jars, then into the canner. I watched the pressure properly -- ten minutes at six pounds, since we're pretty much at sea level here. I even waited for the pressure to come down all on its own, as directed. But then I made at least one mistake, and it's probably personality-driven. Despite my commitment to slow things like knitting, cooking, and growing, I tend towards a smidge of impatience. So I conveniently forgot the instructions to cool the jars in the canner after removing the pressure regulator for ten minutes. That may be the secret behind the siphoning of the syrup -- or it may be an artifact of the lids. At any rate, they're not the perfect product I'd hoped for. I bet they taste good, though, and will be even sweeter for thinking of their friendly source. Added later: They are distinctly pink now, but some noodling around on the interwebs suggests that it's just the way it goes sometimes, and we're not going to die a horrible pear-induced death. Next time, I'm going to try waterbath instead of pressure canning them. Dry beans, astonishingly enough, don't all ripen at once. I've been grabbing the pods as they dry and storing them in a paper bag. I'd sort of fluff the pods up from the bottom as I passed by, to keep them from mildewing. "What am I doing in this bag?" It's an attempt at old-fashioned, foot-powered threshing. Alas, this paper bag was no match for harvest stomping. We shifted to a different method. The two of us sat on the floor and shelled beans and talked. I realized I remember doing something like this when I was very small with my grandmother. It was centering and quiet. We just chatted, compared the beans, talked about growing beans and anything else that came to mind. It was a lovely peaceful interlude. Until my ankles started hurting from pressing against the floor. Once we were all done, we lined up some of the more unusual beans we'd found. The purple one is one of about four or five that were shockingly purple. I don't know if they're a natural expression of these beans or some random pollen from a rogue purple bean patch, but I won't be planting those. The white ones are just a hair lighter than the average bean, but still within range. What really surprised me were the dark, dark, dark ones. The one on the far right is almost dark-chocolate color. And the thrifty gardener in me celebrates any pod with five full beans! These beans are really big -- almost 2cm or so long. One bag led to two full bowls of beans. There are many, many, many more beans drying outside. In fact, another one of the trellises fell down, so this afternoon's pastime will repeat. What a nice way to spend some time, with delicious results. Oh, I also made a few more pickles for the big kid. Just trying to keep up with the vines. When a ten year old says she wants a garden, and then gets it, and keeps wandering through the world of growing food for -ahem- some additional years, there's no guarantee about where it will lead. Until very very recently, I thought of the "urban farming" movement as an American thing, I suppose, if I thought of it geographically at all. I know that there are folks all over the world shoving seeds into soil, and when it Italy of course met people interested in it, as well as those just growing food as they always have. But generally, I keep my head down (eyes whipping around wildly though, because seriously, lots of people, animals, and plants here. Plenty busy) and don't think about The Big World Out There much. Specifically, I had not given much though to the growing interest in local food in . . . Korea. At least, not until recently. A person from one of the three main networks in Korea got my name from. . . well, from the network of local gardening folks. I'm starting to think it was really the "Oh-no-not-me" network. They were filming a documentary on local eating, because of the exponentially growing interest in the subject in Korea, and could they film my yard? My yard that looks as though it hasn't quite gotten enough water for a long time? My yard that has some. . . stuff in it that it didn't need to? My yard and house that are lived in but rarely kept up? Fortunately I am wealthy in spouse and friends and children, and a bunch of people pulled together and cleaned the house until it was sparkly - for our place, and the yard looked mostly like not-crazy people lived there, and when the reporter showed up all was well. Instead of feeling weird, it was like hanging out with someone nice (Hello, Sunghan Lee!!) and talking about what I'm deeply interested and fairly competent at -- gardening and cooking food, with an eye toward local eating. Heck, where I live, it's practically a religion; you just absorb it with the weather. Baby neighbor eats some tomatoes -- she's internationally cute. After all kinds of running around outside, Sarafina and I cooked a quick meal on camera and then we shopped at a store featuring local produce. Everyone was great, but it was a long day. I know the reporter had a good few hours still to go; he must be more tired than I am! Crazy privilege to get to be involved, even in a tiny way, with people as interested in local, homegrown food as I am across the world! The program will air on September 15, so if you're watching Korean television, there's a new documentary coming up.